When young Jim Hawkins discovers a treasure map in a pirate’s chest in his parents’ inn, he is drawn into a world of danger and adventure. 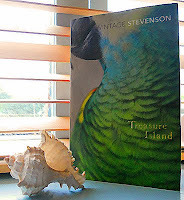 He joins the crew setting sail to the Caribbean to seek out the booty and over the course of the voyage confronts mutiny, murder and the charismatic and devious Long John Silver. 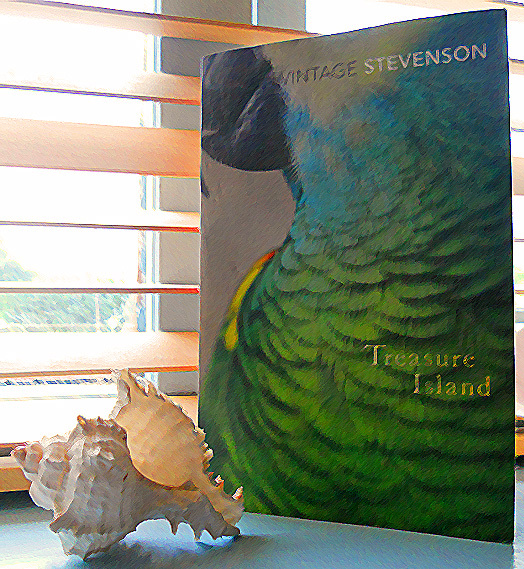 Indeed, first up is the high seas pirate adventure novel Treasure Island by Robert Louis Stevenson! I'm already part-way through the story, so I thought it would be perfect to just keep going and make this my first official book for this blog! Being a fan of pirate films and other swash-buckling outlets, I have been excited to read this legendary story. I must admit though that the first thing that drew me towards it was the pretty cover! Yup, I'm one of those readers who can be swayed by artwork. But can you blame me? Vintage use such beautiful and inspiring covers to draw in readers. I'm glad to see their range expanding within bookshops. Speaking of which, does anybody else desperately miss Borders bookstore? Trips to Oxford really aren't the same anymore without them! I spent hours in there browsing the books and magazines while leisurely sipping a Starbucks vanilla latte. I mean, Waterstones are great, but to me they don't offer the same full experience that Borders did. Every time I walk past their former store location (that's now been turned into a massive Tescos Metro) I can't help but feel sad and overly nostalgic. This may seem dramatic, but it's like an old friend has left and can never come back, but nevertheless you still look for them in the crowd hoping to see their face! I was pretty attached to that store. Oh well... that's what a recession can do for you. Damn economic downturn. But I digress. Treasure Island it is! Hoist the sails, me hearties! I read this book a long time ago. I remember liking it, but I should really peruse it again some time. Thankfully my nearest Borders is still open, but I end up going to small indie bookshops as of late.